1909 antique ILLINOIS HUNTING CASE ORNATE POCKET WATCH - Excellent Cond. 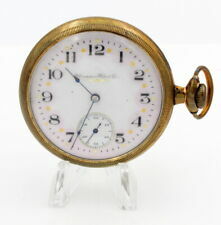 新刊登物品 Antique Waltham Pocket Watch c.1896 Gold Plated 14 carat. 9 ct gold chain. 新刊登物品 1890 ELGIN 18S 7J KEY WIND 24 HOUR DIAL PERFECTION COIN SILVER POCKET WATCH. 新刊登物品 NICE CASE / 1903 ELGIN 0S 7J LADIES POCKET WATCH + 1/20 12K FOB CHAIN. A FIXER. 1950 ELGIN 16S 17J 5 ADJUSTS 10K R.G.P. POCKET WATCH. WORKING.